It is our Sacred Duty to warn America that the “term”—a fixed term—of her power to exercise authority and rule not only over her own citizens, but over the peoples of the Earth: That term is fast coming to an end. That is, those people who live after the destruction of this present world and its power to rule. 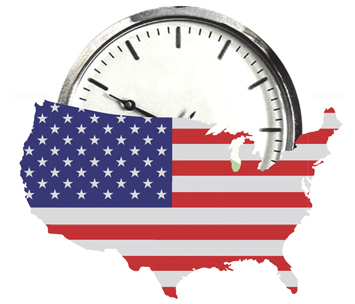 In November 2012, a writer wrote an article titled: “The Decline and Fall of the American Empire.” America, in her decline, is not as attractive as she once was; she is not as wealthy as she once was. But, like most beautiful people that become ugly: They find a way to get a “facelift,” or something to make them look more attractive again—and this is what the “Federal Reserve Bailout of America” was: $85 billion a month, buying mortgage notes, and treasury notes, etc. Well America, this is false! Because with the money that you’re borrowing: You’re already over your head in debt! And the Federal Reserve is printing money with no backing (fiat money); so this allows you to keep on “looking good” in the eyes of the world. But it soon will collapse; that look, even though you’ve got a “facelift,” as some do, it begins to sag and fall, and the ugliness comes back again. “The daughters of Babylon seem to have been a very rich people and they had fallen from a state of great wealth. Isaiah used Babylon as a pretty girl whose lovers used to be plentiful because of her wealth and attractiveness; [but] now she has become ill-looking and has no more attraction upon the people. So he said, sit down in the dust, you are no more respected and attractive to the people. The prophet Jeremiah warned ancient Babylon that she had a daughter coming. This daughter meets the fate destined for Babylon: she was made to be taken. Well, this modern “Babylon” is now at the term of its end. In the Book of Revelation, the 12th Chapter, verses 1-5, the scripture is talking about a “wonder in heaven,” a woman that was pregnant with a child that was destined to rule the nations with “a rod of iron”: “And there appeared a great wonder in heaven; a woman clothed with the sun, and the moon under her feet, and upon her head a crown of twelve stars: And she being with child cried, travailing in birth, and pained to be delivered. ... And she brought forth a man child, who was to rule all nations with a rod of iron: and her child was caught up unto God, and to his throne.” This “child” is The Heir to The Vineyard. This “child” is The Future Ruler of The Next World. This “child” is a representative of a People like “a stone” that the builders rejected, and is now becoming The Head Stone of a Corner of a Brand New World and Civilization! You don’t get a stone out of a mountain without “some hand” being put to get that stone! But the Honorable Elijah Muhammad told us that the “mountain” being referred to here is America; and “the stone” that is being hewn out of the mountain is The Black Man and Woman of America—God’s Choice! And as that “stone” rolls down the mountain, and picks up mass and strength; and smites a great image with a “head of gold,” a “breastplate of silver,” “legs of iron and feet” and “iron mixed with miry clay”: The Honorable Elijah Muhammad explains the vision of that great image! With “the feet of iron mixed with miry clay” says that that “head of gold” has a very weak foundation. The foundation of “the wealth of gold and silver” in this world is based on “the poor,” who are the weak of the world! And this is why The Enemy always feared when any man would rise from among The Poor, and be listened to by The Poor; because as The Poor rise, The Rich fall! And so this stone, “hewn out of the mountain,” strikes the image at its foundation, and the image collapses. And the stone becomes so great, that it fills the Earth—so it is with that parable that the Honorable Elijah Muhammad pointed out, when Jesus spoke of “The Mustard Seed”: How tiny it is when you see it, but when it is planted in the proper soil, under the right environmental conditions, that seed bursts into a “tree.” And the scripture teaches that the beasts found refuge under it; and the birds found refuge under its branches. This “Babylon,” this “Modern Babylon”—the United States of America and her great influence in the world … Well, if Satan was made to be “taken and destroyed,” and Babylon was destroyed and never was allowed to be rebuilt: Right now in Iraq, Babylon is there, but she’s not rebuilt. And so it was with Sodom and Gomorrah: As God destroyed it, not even a blade of grass grows there today. So terrible was God’s Hate of the practice going on in Sodom and Gomorrah, and so great was God’s dislike of the kings of Babylon! America is like that today: A Modern Daniel has arisen out of the Black man and woman of America! And he is telling you that on “the wall of your security” it is written: “Your kingdom has been weighed in the balance, and found wanting”! So in the Book of Revelation, the 12th Chapter, verses 7-10 it teaches: “And there was war in heaven: Michael and his angels fought against the dragon; and the dragon fought and his angels, And prevailed not; neither was their place found any more in heaven. And the great dragon was cast out, that old serpent, called the Devil, and Satan, which deceiveth the whole world: he was cast out into the earth, and his angels were cast out with him. And I heard a loud voice saying in heaven, Now is come salvation, and strength, and the kingdom of our God, and the power of his Christ: for the accuser of our brethren is cast down, which accused them before our God day and night.” Here, we are looking now at “war”: War between The Dragon/The Serpent/Satan and his angels, and Michael and his angels. Then it goes on in the 12th verse, stating: “Therefore rejoice, ye heavens, and ye that dwell in them. Woe to the inhabiters of the earth and of the sea! for the devil is come down unto you, having great wrath, because he knoweth that he hath but a short time”; and again, as we are taught in Rev. 11:18, “And the nations are angry, and Thy wrath is come, for it is the time of the dead, that they should be judged and given justice”—so now you have “two angry ones”: 1) Satan and his angels, who are angry; and 2) God, Who is furious, the scripture says, with Satan. God is giving America a chance! Babylon could have been healed, but she was not because she refused to listen to The Warnings of Daniel. Babylon, then, was taken and destroyed. 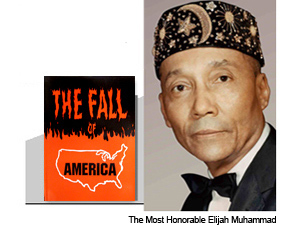 And the Honorable Elijah Muhammad asks, “Will America repent?” “Will she heed The Warning of that man of God in her midst, the Honorable Elijah Muhammad? Will you hear his cry to you? Will you hear the Modern Moses and his Aaron? They are pleading with you to let the People of God go! 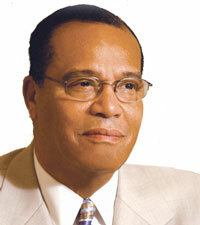 God wants to make the Black man and woman into a great nation, with a great future and a great destiny! Well if he doubts—and doubted then that you would repent—then 40 years or more later here we are: You have not repented. You have not done justice by us. You are still deceiving the Black people of America and the world. And it is written that you’ve been “let loose” now; you’ve “come down,” and have been “thrown out of heaven.”… There actually is prophecy found in the Books of Isaiah, Chapter 13 and Jeremiah, Chapter 50 that you are going to be “displaced throughout the Earth”! You’ll be put out of Asia: You have your fleets there. You have your tremendous arms there. But they won’t keep you in Asia. Israel: You have not had any peace. In my address at the National Press Club on July 30, 1984 I said, “for 40 years you have not had any peace, nor will you have any peace.” Now, Israel, over 20 years later you’re still talking about a “peace plan.” But there will be no peace, because the “peace” that you want is peace on your terms! And that is not going to happen. So all kinds of mischief and trouble are being made in that area of the world. … Remember that scripture, “The devil has come down unto you having great wrath because he knows he has but a short time”? His wrath, his mischief-making, his blood-shedding, his meddling in the affairs of other nations is now being seen in the Middle East. Why would the Palestinians not want a “separate state”? Why wouldn’t they want their own people that have been made vagabonds (“homeless wanderers”) in the Earth to have the right of return to their native land? Why would you say you want “two nations, side-by-side” living in peace—but you will never allow the Palestinians to be armed, to protect the sovereignty of a Palestinian state? You will never allow them the weapons that would allow them to protect their own airspace! You know that! And I know that! So what kind of “sovereignty” will they have with no ability to protect themselves from any outside force? No, I am sorry. … There will be no “peace” with Israel and the Palestinians. And Israel, are you beginning to see: You are losing all over the world! As I wrote, when we put out the 2nd Edition of The Secret Relationship Between Blacks and Jews: I warned all of you that there is a way that you could sit down with The Nation of Islam, and work out “a way forward,” because “what was” does not have to be “what is”! But if you persist in fighting me, as The Representative of that Great Messiah, then you are only hastening the day of your doom. Well, he soon found out. … After 10 Plagues, the Last Plague being “Death,” Pharaoh told Moses, “Come on! Get your people, and get out!”—but Pharaoh couldn’t bear the thought that if they got out, God was going to make them a great nation. So after he told Moses, “You could go,” and gave him a good sendoff—and even some of the Egyptians went out with Moses, and they took silver and gold with them—then Pharaoh sent his army to destroy The Children of Israel. And Pharaoh, and his army, were drowned in The Red Sea. In “The Great Seal” of the United States of America, the first one that was commissioned to be designed in 1776, on the back of the Seal appeared a coat of arms of the six European nations that made up this new nation, this new country, “The United States of America.” And all six of those nations were White; all six of those nations were European. But brothers and sisters: If you were “citizens,” why are you still fighting for “equal justice,” “equal rights,” “equal education,” “equal employment opportunities”? You are still begging for this! Can’t you see that if they cannot produce jobs for their own millions of unemployed, they cannot produce jobs for us? America: You will not let our people go. You, like Ancient Babylon, are going to fight God till the end. I feel sorry for you. … You know, Pharaoh fought against God. But as he was dying in “The Red Sea,” he recognized The Power of God against his delusion of power, and he said: “I bear witness that there is no God but Allah.” And in his bearing of witness of God in his dying breath, the scripture teaches that his body was saved. If you go to the museum in Egypt, you will find his body there as a sign to you, America. God saved his body so that you could see; because you’re in the same state, or worse, than Pharaoh! Babylon could have been healed! Pharaoh could have been spared! America could be spared—but it is your leaders, drunk with the power of their delusion of might, who are ready to fight against God. Look at the way we think, Black brother! Your thinking is not right—and your hands are doing the work of your thoughts! That is why in the ghettos of America we’ve become the No. 1 killers of ourselves and our people: We are fierce, we are brutal, we are demonic; we are at “the force of arms.” You’ll get these guns, and you love to just point them at people, and shoot them down like wild dogs! The Enemy has made you into himself! And you, too, are headed for Divine Destruction! Study what the Book of Revelation teaches in the 9th Chapter, 6th verse, because the Honorable Elijah Muhammad said to you that God is not going to allow you to go down with The Enemy. In Rev. 9:6 it is written: “And in those days. …”—The Days of God’s Judgment and Fury on The Enemy—“shall men seek death, and shall not find it; and they shall desire to die, and death will flee from them.” This is where we are heading: One Great Year of Chastisement for you, and me, and us. Remember this, as these calamities increase. Oh, America, this is the country I have known … At one time I hated you America, for the evils that you have done to our people. But as Paul said, “When I was a child, I thought as a child, I spake as a child”—but growing into the maturity of The Word, I now understand that you were made to do exactly what you have done. In the last message that the Honorable Elijah Muhammad gave to us before he Departed from among us, he said, “You cannot blame the clay. You blame the potter who shaped the clay.” The “Made Man” was shaped in a nature that was adverse to The Nature of God. So the things that you do: Much of it, you can’t help it! And that’s why Jesus said, “I know you. You are of your father the devil. He was a liar and a murderer”—and that “Lie” is born into your nature. You are “The Great Deceiver,” because that lie, and murder, is born in your nature. On one of these future broadcasts, I want to go into this with you, and then help you to see that there is a “door out” for you just as there is a “door out” for us.